Quick overview Architecture matters. To our cities, to our planet, to our personal lives. How we design and what we build has an impact that usually lasts for generations. This book focuses on the mechanisms, politics and personalities that play a role in how buildings in our societies and urban centres come to be. Architecture matters. To our cities, to our planet, to our personal lives. How we design and what we build has an impact that usually lasts for generations. The more we understand the importance of architecture, and the thinking and decisions behind the buildings we create, the better world we will construct. 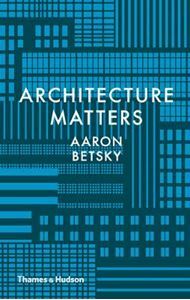 Who better to guide readers into the rich and complex world of contemporary architecture than Aaron Betsky, former architect, author, curator and museum director, and today dean of the Frank Lloyd Wright School of Architecture. Combining his early experiences working and meeting cutting-edge architects with his frequent role as jury member selecting the world's most prominent global architects to build icon for cities, Betsky possesses rare insight into the mechanisms, politics and personalities that play a role in how buildings in our societies and urban centres come to be. In some fifty themes and drawing from his own experiences and encounters with people and buildings around the world, he explores a broad spectrum of topics, from the meaning of domestic space to the spectacle of the urban realm. Accessible, instructive and hugely enjoyable, this book will open the eyes of anyone dreaming of becoming an architect, and bring a wry smile to anyone that already is.